Volvo Trucks is rolling out a fantastic line-up for Truckfest Peterborough this weekend. Highlight of the stand will be a top spec ‘Ailsa’ Edition FH16-750 – one of a very special limited edition of 50 being built to commemorate Volvo’s 50 years in the UK this year. Sharing the top of the bill is the record-breaking ‘Iron Knight' - a super custom-engineered truck that boasts a 2400hp version of Volvo's D13K 13-litre engine which produces some 6000Nm of torque. By comparison, the D16K, 16-litre engine in the ‘Ailsa' Edition tractor unit, the most powerful series production truck, develops 3550Nm of torque and 750hp. Amazingly, the ‘Iron Knight' delivers its phenomenal power through Volvo's series-built, super slick shifting I-Shift Dual Clutch. The celebration of the company's golden anniversary provides the overarching theme for the Volvo Trucks stand this year with tons of great activities and 50th Anniversary branded shopping opportunities for all the family. Among these activities is the ‘Turning 50' online interactive game. It is a great matching game over five levels to celebrate Volvo's five decade history and test your memory, whilst having some fun at the same time. Weighing in at just 4.5 tonnes, the ‘Iron Knight' is capable of blasting to 60mph in 4.6 seconds and running a standing 1000 metres in 21.29 seconds and 105mph. During the record attempt, it topped out at 172mph. 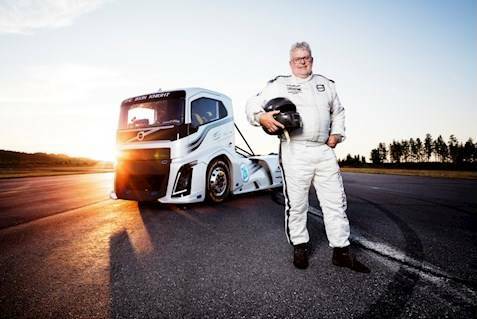 Driver of the ‘Iron Knight' is the legendary Boije Overbrink who will be with this amazing machine on the Volvo stand. He is no stranger to Truckfest and visitors will remember him from 2011 when he attended the show with the ‘Mean Green' Volvo Hybrid. Speaking after the latest record attempt, Boije summed up what the ‘Iron Knight' is all about: "The Iron Knight can be summarized in one word - perfection. It's beautiful to look at and is an unparalleled powerhouse when you floor the accelerator." Five times record-breaker and former European Truck Racing Champion Boije will be available throughout the show for interview and autographs and to show visitors around the ‘Iron Knight'. In addition to these two crowd-pleasing trucks, there will be a full range of the latest Volvo hardware on display. Not least of which is an FH16-750 8x4 Tridem push axle tractor fitted with the latest I-Shift Crawler Gears transmission, the Globetrotter XL cab finished in orange and a host of safety features to help the driver. These include Electronic Stability Programme, Adaptive Cruise Control, Lane Change Support, Lane Keeping Support and Driver Alert. Also on show on the Volvo Trucks stand are two top spec FH and FM 6x2 tractor units equipped with the latest, factory fitted Lightweight Push Axles. The FH features the D13K 13 litre engine rated at 500hp and the ‘payload-friendly' FM has the D11K 11-litre engine rated at 450hp. Rigids on display include what must rate as one of the highest spec FM 8x4 tipper-grab trucks of all time. This amazing orange monster boasts full air suspension, the D13K-500 13-litre Step C Euro-6 engine, AT2612E I-Shift 12-speed automated gearbox, Drive+ trim and Fuel Economy software, Active Safety+, Visibility+, Dynafleet, Personal protection and Parking climate control. There is also a similarly specified FM-500 Hooklift and an FMX-420 8x4 Extra High B-ride rigid tipper fitted with Volvo Dynamic Steering and a Thompson Loadmaster Steel body. Volvo's lightweight range is represented by two trucks - a high spec FE-350 6x2 rigid fitted with a Lawrence David Brick and Block body with Hiab crane and an FL-250 skip loader which features the 6-speed I-Sync automated gearbox and Hyva bodywork. Two FH4 tractor units from the Volvo Used Trucks Selected Used programme will also be on the stand. For the first time, in conjunction with Truckfest organisers Live Promotions, Volvo Trucks is sponsoring a new judging category at the show - this is for ‘‘Best Volvo at Peterborough'. The new category is being judged, by an independent panel, from all the Volvo trucks at the event. The winner will be announced at the end of the Show. The winner will receive a trophy, Volvo Merchandise ‘Goodie' bag and prize money. In addition, visitors to the stand will be able to purchase items from the latest range of Volvo Trucks' official merchandise and the latest scale model trucks. The local Volvo Truck dealer will also be selling a selection of their extensive range of Roadcrew truckers ‘goodies', such as cleaning products, security devices, bulb kits etc., together with some special one-off Show offers. It is anticipated that Volvo will also be promoting their social media offerings with daily prizes on offer through both their Facebook and Twitter platforms. Finally, Volvo will also have the benefits of resident MC - Chris Holland - to keep visitors abreast of all the offers, product and maybe even the arrival of the odd celebrity guest during the weekend.